Remind me not to read those triathlon magazines again. I came across an alarming article the other day, talking about a spate of triathlon deaths. About three happened in America in the space of a couple of weeks last year and it pointed out 23 finely-tuned athletes had died over the years. But more worrying, 18 of those had all died during the first section - the swim. 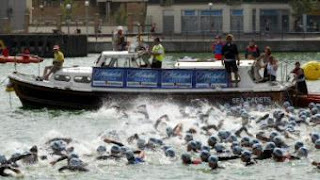 I am still to swim in open water which will be the task in the docks outside the ExCel Arena come August 2, covering 1.5k. And swimming is my weakest of the three abilities. Oh dear, I better up the lengths in the pool - quickly. So I read further down, surely there was a few bits of advice to help reassure this delicate first-time triathlete. American Russ Evenhuis was on hand for some words of wisdom. “Nothing can prepare a newbie for the start,” he stated. Then triathlete and coach Neil Cook chipped in about no matter how much you do in the pool, the swim will still daunt you. Heartbeat rising under those conditions? It’s beating like a drum just thinking about it. What can I take from that as I look to prepare in the best possible way. Scrap the swimming pool and jump in the washing machine for a hour every night? Maybe even head to the local laundrette. Well, there is more room in those industrial-sized beauties. I am in a spin already. Maybe I’ll invest in a pair of armbands. Surely that is better than chancing meeting my maker in the cold and murky waters of the Royal Victoria Dock.